Undenominational School’ by a committee which had been formed and who passed a resolution charging that local architects be invited to submit plans for the erection of a suitable school building to afford Accommodation for the 75 pupils and accommodation for a Master, and suitable offices. The resolution implied that the Architect, Mr A C A Cator, should be given one month to submit plans for the building not to exceed £1 000 in cost, although the actual cost rose to $2 000, for a building comprising one single classroom, plus two small rooms, and verandah for the Headmaster. Prior to this, the British South Africa Company had granted the committee access to four acres of land in Moffat Street. The Headmaster and a lady teacher were appointed by the Superintendent of Education in the Cape Colony, at salaries of £ 180 and £90 per annum respectively. These two positions were filled by the first Headmaster, Mr John Kerr, and the first teacher Mrs Garcia from South Africa, who arrived by coach from Bulawayo, since the railway had not yet reached Salisbury. On the 14th November 1898 in midterm the Salisbury Public Undenominational School was opened, and it is interesting to note that the first intake of 2 boys and 2 girls included such names as Vivian and Frank Pascoe. 1899 – Twenty one pupils were enrolled, each paying 10 shillings a month. 1900 – 27 pupils were enrolled. Frequent disputes between Mr. Kerr and Mrs. Garcia did not enhance a happy future, added to financial problems between the Government and Municipality, which brought matters to a head. 1902 – 39 pupils were enrolled. A new Headmaster Mr. H Duthie was appointed. 1903 – Mr. D Blue was appointed Headmaster. 1908 – 52 pupils were now enrolled. The girls moved out of the School and the name “Salisbury Boys’ High School” was adopted. 1909 – First Dux Prizes were presented by the Municipality. 1910 – Mr. L J Grant was appointed Headmaster and 6 new classrooms were erected to accommodate 300 Boys. The first 12 Boarders arrived and were housed at “Brownings” North Avenue. The first colours were introduced and the School Motto” Tantum Facienda Parum Factum” was adopted. 1911 – The first School Magazine was introduced on a twice per annum basis. 1914 – 1918 – Great War – Prince Edward School pupils served with distinction. 15 pupils were recorded on the Roll of Honour plus the Headmaster from 1903 – 1910, Mr. D Blue. 1917 – Mr A J Somerville was appointed Headmaster. 1918 – Peace and return to normality. 1920 – Inter house activities were introduced and Four Houses were created Jameson, Rhodes, Selous and Wilson with their Latin Mottoes. 1922 – The formation of the Old Hararians Association. 384 pupils were registered. 1923 – 400 pupils were registered. Silver Jubilee (25 years) was appropriately celebrated. 1924 – 463 pupils were registered. 1925 – Visit of H, R. H. Edward, Prince of Wales, to the school where he planted a tree in the grounds. Prince Edward School acquired its present name. 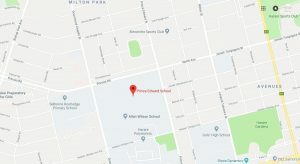 The school was split into Primary and Secondary school, with Prince Edward School moving to its’ present (now) 51 acres site on North Ave / Prince Edward Street. 1931 – Beit trust donated the Beit Hall, enabling stage and Dramatic Productions to be performed. 1935 – The swimming pool was opened. 1939 – The junior school was removed and pupils transferred to other schools. The Second World War broke out and pupils volunteered for services in the armed forces. 1945 – The Roll of Honour records that 135 pupils gave their lives for the preservation of world peace, and the destruction of international tyranny. 1940 – The school song was adopted. 1941 – Mr. A J Somerville retired after 24 years as Headmaster. He was succeeded by Mr. H G Livingston as Headmaster. 1942 – Establishment of Fund to build an Undenominational Memorial Chapel. 1947 – Mr. H.H Cole appointed Headmaster. School Motto changed to “Tot Facienda Parum Factum”. 1951 – The foundation stone for the memorial chapel was laid by Sir Godfrey Huggins. 1952 – Mr. J A Slaven was appointed Headmaster. 1953 – The completed chapel was dedicated by the Bishop of Salisbury, the Right Rev Dr. F R Paget, the Rev J Kennedy Grant and the Rev H Carter. 1956 – Mr. J E Gaylard was appointed Headmaster. The first school fete, a gigantic effort, was held to raise £4700 for the building of a new sports pavilion. 1959 – New Sports Pavilion was opened on the annual Reunion Day. The new Hobbies Block was built to encourage activities in the Motor, Printing and Photographic clubs. 1962 – The John and Robert Downie Museum was built with funds raised from a Firework Fair total £2500. 1963 – Establishment of main library and open air gymnasium. 1965 – Mr. E C.C Owen appointed headmaster. Prince Edward air cadets reformed. 1966 – The Observatory was erected for the astronomy club founded in 1957. 1968 – Mr. M R S Falconer appointed Headmaster. 1972 – Mr. R.A. Suttle appointed Headmaster. 1973 – The Harry Robinson Study Centre (presented to the school 75th anniversary gift), was planned. Completion of the administration block and School Mini Arboretum was established. 1974 – Closing of the traditional entrance to the school in Prince Edward Street, and a new entrance opened in North Avenue. 1975 – Harry Robinson Study Centre was opened. Metal workshop was established. 1976 – Two new Squash Courts were built. 1977 – Sixth Form Study Centre Library opened. New staff room occupied. Four new tennis courts opened. 1979 – 3 new tennis courts were opened. 1980 – New era dawns with registration of first nonwhite boys to the school. 1980 – National Independence Year. 1986 – Mr. C R Barnes appointed Headmaster. 1987 – 1423 pupils registered. 1988 – 90th Anniversary celebrated. First PLO Computer Camp staged at PE. 1989 – Mr. G K Atkinson appointed Deputy Headmaster. Speech Day Guest of Honour Mr C Andersen (Minister of State Old Boy of PE). PE won Major Leyland Basketball Shield Competition. 1990 – Number of pupils 1510. Guest of Honour Speech Day His Excellency The Ambassador of the Arab Republic of Egypt Dr. Badawi. PE won the Inter Schools’ Athletics which they hosted at the National Sports Stadium. Second PLO Computer Camp staged. Grant of Japanese Instruments to PE School. Music Department formed under Ms. L Roberts. Since 1986 PE has staged the National Schools’ Rugby, Hockey, Cricket and Basketball Festivals. 1991 – A particularly memorable year with a visit to Prince Edward by her Majesty Queen Elizabeth II, accompanied by Prince Phillip, Duke of Edinburgh, on October 11. Her majesty planted a tree in the school’s arboretum to mark the occasion. Commonwealth Heads of Government Ministers (CHOGM) met in Harare and played a cricket match against the school, their team including celebrities such as Bob Hawke (Australia), John Major Prime Minister of Great Britain), President Gayoon of the Maldives, Clive Lloyd, Graeme Hick, Nawaaz Sharif (Prime Minister of Pakistan), Dr. Kennedy Simmonds (Prime Minister of St Kitts Nevis) and many others. The Speech Day guest of Honour was Sister Katherine Jackson, a highly talented person, renowned for her devotion to blind people, since she herself has been blind since 1985, as well as handicapped people, conservation and environmental issues. Sister Jackson is also well known for her service through Rotary International. 1992 – Speech day guests of honour were Mr. and Mrs. Chingoka and the school enjoyed an excellent academic year with a 90% A Level pass rate, a 51 % pass rate from 1924 entries at 0 Level, and an 83 % pass rate at ZJC level. The school’s rowing team entered the South African Championships, the first for many years, and Prince Edward Old Boys staged a reunion at Nyanga for boys who attended the school between 1950 and 1962, resulting in a $100 000 donation to the school. 1993 – Cultural activities received increased emphasis, particularly in the area of music, where great progress was made in Ethno music studies, alongside improvements in the school’s commitment to academic achievements. Speech Day guests of Honour were Mr. and Mrs. A Made. Mr. Made is an internationally renowned environmentalist, who contributed much to the school’s installation of the only Earth and Weather Global Village Satellite Tracking Station, which became operative at the school during August 1993. In the same year, Prince Edward’s rowing team became South African champions. 1993 also marked the inauguration of the School Development Association, with Dr. B Campbell as its first chairman. Created in addition to the PTA, the School Development Association came into being with the objectives of assisting with the running of the school as well as working towards the provision of a Cultural and Music Centre to mark Prince Edward’s centenary in 1998. 1994 – Guest of Honour at the school’s annual Speech Day was Dr. T Samkange, while the school achieved the best academic results in nine years, with a 70% pass rate for the 220 candidates who wrote A Level. 1995 – Saw the launching of the Centennial Fund, with a visit to the school by HRH Prince Edward on August 31. 1996 – First “colour” edition of the magazine. Mr George Armstrong passed away on February 10, 1996 after 43 years’ service to Prince Edward School. 1997 – 99th year of the school. 1998 – Centenary year 100 years of Prince Edward School.